Dr. Daniel Riew is a Professor of Orthopedic Surgery at Columbia University Medical Center’s College of Physicians and Surgeons in NYC. He is also the Co-Chief, Spine Division, Director of Cervical Spine Surgery and Co-Director of the Columbia Spine Fellowship. He joined the Columbia Faculty in July of 2015. Previously, he was at Washington University in St. Louis where he was the Mildred B. Simon Distinguished Professor in the Department of Orthopaedic Surgery, Professor of Neurological Surgery and Chief of Cervical Spine Surgery. Dr. Riew graduated from Harvard College, where he was awarded the Class Ames Award for Character and Leadership; and from Case Western Reserve University Medical School, where he was inducted into the Alpha Omega Alpha honorary medical society for top students in his junior year. 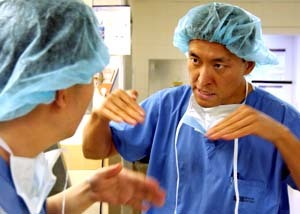 He finished residency in Internal Medicine at Cornell Medical Center and Orthopedics at George Washington University. He then completed fellowship training under the world-renowned cervical spine surgeon, Dr. Henry Bohlman in Cleveland. He is board-certified in Internal Medicine as well as Orthopaedic Surgery. In 1995, he was recruited by Washington University School of Medicine to start the cervical spine service in the newly formed Department of Orthopaedic Surgery. Starting with only a dozen or less cervical procedures in 1994, he developed it into one of the largest cervical spine practices in the world. His practice is exclusively devoted to the operative treatment of the cervical spine, a rarity among spine surgeons. American Board of Internal Medicine, 1987; American Board of Orthopaedic Surgeons, 1997; Recertified, 2008.